This fountain was installed to commemorate Emily Margaret Waddell. Mrs. Waddell died in 1908 and stipulated in her will that if her husband Thomas, a local temperance leader, remarried, he donate $10,000 to the City for construction of a fountain. Mr. Waddell, who did remarry, was able to raise the funds and in 1914 met his obligation. Local architect John Manuel was selected to design the fountain. Manuel also designed structures at the University of Manitoba and was active in the Manitoba Association of Architects before relocating to Alberta in 1927 to direct construction of Canadian Pacific Railway hotels at Banff and Lake Louise. 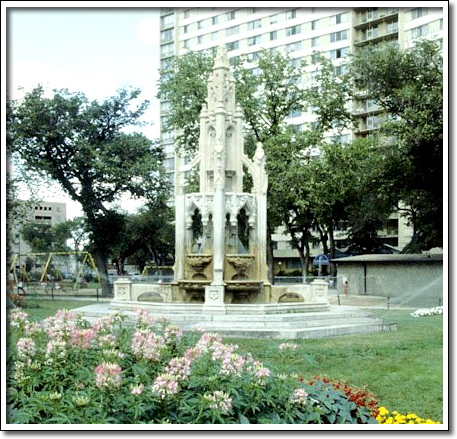 The Waddell Fountain is a rare example of High Victorian style in Manitoba and is based on the 1844 Gothic Revival monument in Edinburgh to Romantic poet Sir Walter Scott.